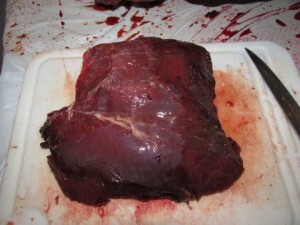 Dear readers, this post contains graphic images of meat including meat juice (aka blood). Just fair warning if that kind of stuff makes you squirmy or queasy. We butcher our own game meat. Every time I do this I swear next time I’m going to send it to the meat plant, but next time rolls around and there we are cutting it up on our counter again. Why? Because we’re cheap. It only costs time and about $40 for a box of freezer bag rolls for my FoodSaver vacuum sealer. Plus, packing it with the vacuum sealer gives the meat extra freezer-life as it won’t get freezer burned as quickly as paper packed meats. 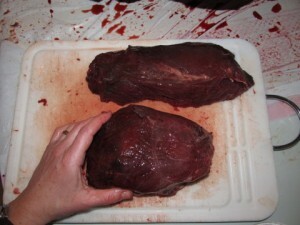 Today we’re cutting up an elk hind quarter. 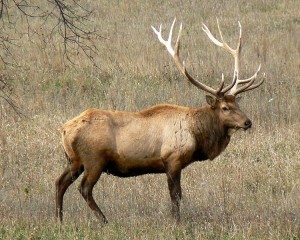 Elk are large ungulates, larger than a deer and smaller than a moose. 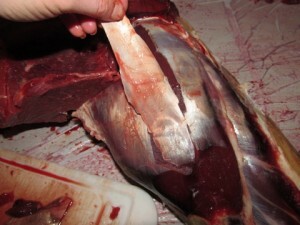 This meat cutting process also works for other similar animals like antelope, sheep, deer, moose, cow, etc. 1. To start, I put plastic down on my counter. I cut open a kitchen trash bag and tape it down on the corners. It helps keep some of the mess contained. Then lay the hind quarter on it. 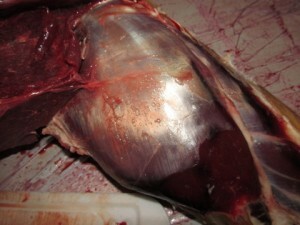 The hind quarter is one of the back legs. You can see the ball part of the hip joint in the picture. In this picture I have marked approximately where the bones run. It’s not too big a concern–you’ll find them eventually, but it’s kind of nice to know where to expect them. 2. 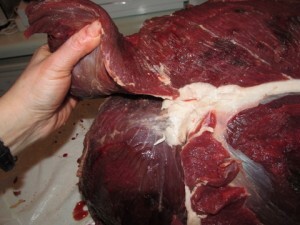 Trim off all the hard outer meat and fat. I’ve already done this in the above photo. 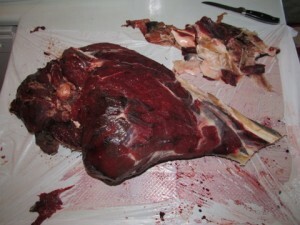 If your elk was hanging to age, the outside of the meat hardens a little bit. I just trim that off. By getting this top layer off, it is easier to see where the muscles separate. 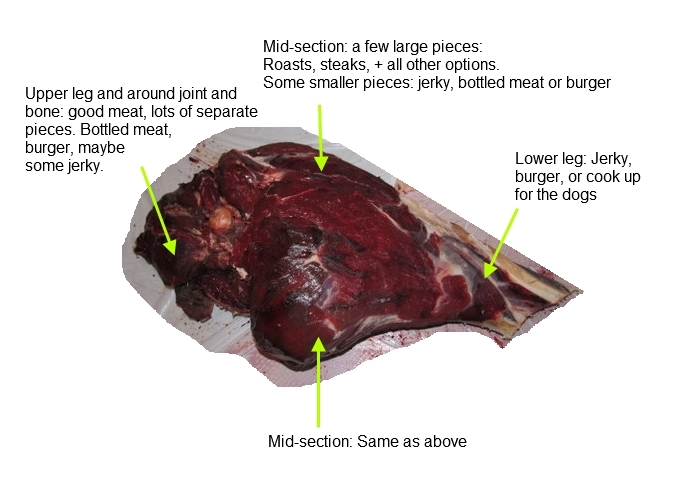 You’ll need to turn the whole thing over occasionally as there is plenty of meat on both sides of the bone and some of the muscles wrap around to both sides. As you cut, you will find “silver skin”. This is usually a thin outer layer on the muscle made of tendon. Sometimes it runs into the middle of a piece. I like to trim as much of this off as possible, so sometimes this means I’ll cut a piece in half to get the stuff out of the middle of it. To trim the silver skin, it works well to insert your knife just under it in the middle and work to one end first, then hold the loose part and cut to the other end. Occasionally you can get your knife started at one end or the other and that works okay also. Some pieces are not thick enough for a roast or steaks, so that limits what you can do with them. Make them jerky, bottled meat, or hamburger. 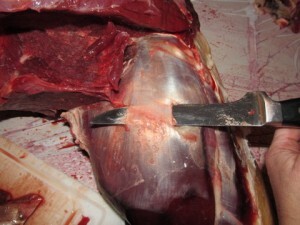 Below the knee joint, the meat has a lot of tendon running through it. 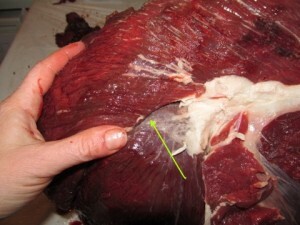 If you want to trim and get to the little pieces of meat, you can get some for jerky or hamburger. If you’re sick of cutting elk, these pieces are great for cooking up for the dogs. If you cut them up for jerky leaving the tendon in them they are super chewy and you end up spitting half the piece out. We got some meat given to us once that a plant has packaged and they had cut the lower leg into jerky without getting any of the tendon out. Ew. Lower leg: Edible, yes. Pain in the neck to make useable, yes. photo of the end of the lower leg piece–see all the light colored lines? Those are all tendons that run through the piece of meat. 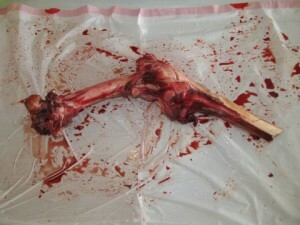 Some pieces are huge with no tendons or “silver skin” running through them. You’ll probably want to cut these down into pieces your family could eat in a meal or two before freezing them. These are great for roasts and steaks. Nice chunk of meat, but it’s too big! Big chunk cut into two useable size pieces. To cut jerky, cut with or across or diagonal to the grain depending on how chewy you like your jerky. Cutting with the grain makes a more chewy piece, across the grain is easier to eat. 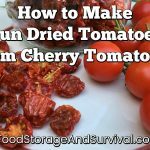 Cut thin and either lay right on your dehydrator trays or freeze for later. 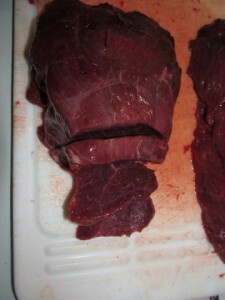 To cut steaks cut across the grain about 1/2 inch thick or more depending on how you like your steaks. We like ours thin and breaded. Keep cutting until you’re down to just bone. You’ll probably need to sharpen your knife more than once. Once it’s all cut, then you get to freeze, bottle, grind, or dehydrate all your pieces. It’s worth it in the end. Really. Meat scraps hooked to the tendons you cut off or the hard outer meat can be cooked and fed to your dogs. Raw meat can give them intestinal problems which is not desirable if you share the same house at night. We set the leg bones outside our fence so they don’t stink up our trash can. We intend to throw them in on trash day of course, but magically by trash day somebody’s dog has usually dragged them away for us. 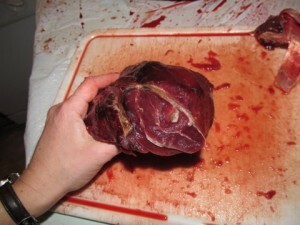 And that’s how we cut up an elk hind quarter. Happy slicing!